Way back in November ELRC was asked to help out with some filming. 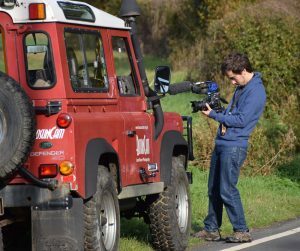 A crew from The Telegraph were making a film about Land Rovers and needed some background action images. Our proximity to London made us an easy choice. The team came by train and were picked up from the local station by Discovery – their studio for the day. The rest of us – two 90’s and a 110 were fitted with cameras and we set out on our adventure. We had two local lanes planned for the day. Both had good surfaces and plenty of room to stop to regroup and discuss what was required. They wanted to know if there was any water nearby, of course the first lane contained a ford! Was it luck or just excellent planning? The lane and ford had been chosen for the stoney surface so there was minimal impact when we made several crossings. They had chosen a gloriously sunny autumn day so they really got to see our Land Rovers and the countryside at its best. The film is to a certain extent about theft, well the theft of one person’s Land Rover. But more importantly it is about the sentimental attachment that all Land Rover owners have to their vehicles. We can certainly understand that.